Living Social: $20 Soap.com Voucher for Only $10! Living Social has a really great deal from Soap.com. You can get a voucher for $20 for only $10 Soap.com is a great website where you can get most of your household, beauty, and baby care needs. They also provide FREE shipping on all orders over $25. I always grab this offer when it’s available. I stock up on my toilet paper and paper towels, two items that are hard to buy with coupons. Sign in or sign up for Living Social and select “NYC Downtown” as the city. Click on “Buy Now” to get the deal. This is an online deal so anyone can purchase it. 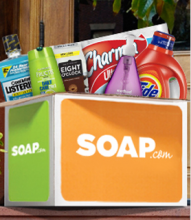 Daily deals Jun 27, 2011 in family, household, SoapDotCom · Expired! Why Soap.com is a great way to shop. I didn’t start using Soap.com until I got a great Groupon deal a while back. That was the last time I used Soap.com until I started looking into the service a bit more. 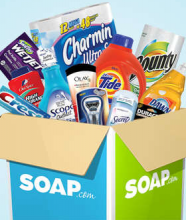 Soap.com has over 25,000 items at a discount of around 25%. If you only need a bottle of shampoo, then this may not be for you. However, if you like to get everything at once, give it a try. I just ordered a huge box of supplies as a housewarming gift, and it was delivered the next day! So far, I’m sold. Their customer service has been great so far, and their prices are hard to beat.